Are you ever at the point where you just crave something really simple but oh, so good? That happened to me not long ago. We had been out doing Saturday morning errands and it was rainy, windy and chilly. When I got home I just wanted something hot, and satisfying. 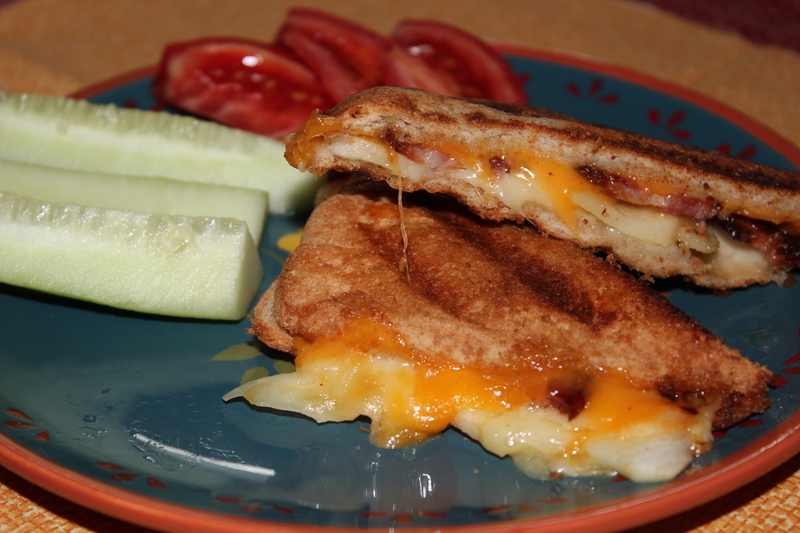 My husband suggested Grilled cheese sandwiches, which I thought was a good idea, but as I got started preparing them one thing led to another and I ended up creating these sandwiches that were oooey, gooey good with the addition of crisp bacon and thinly sliced apples with the cheese. These have now become my new go-to sandwich for when I need some comfort at lunch time. YIELD: makes 2 sandwiches. Scale ingredients up to make more. 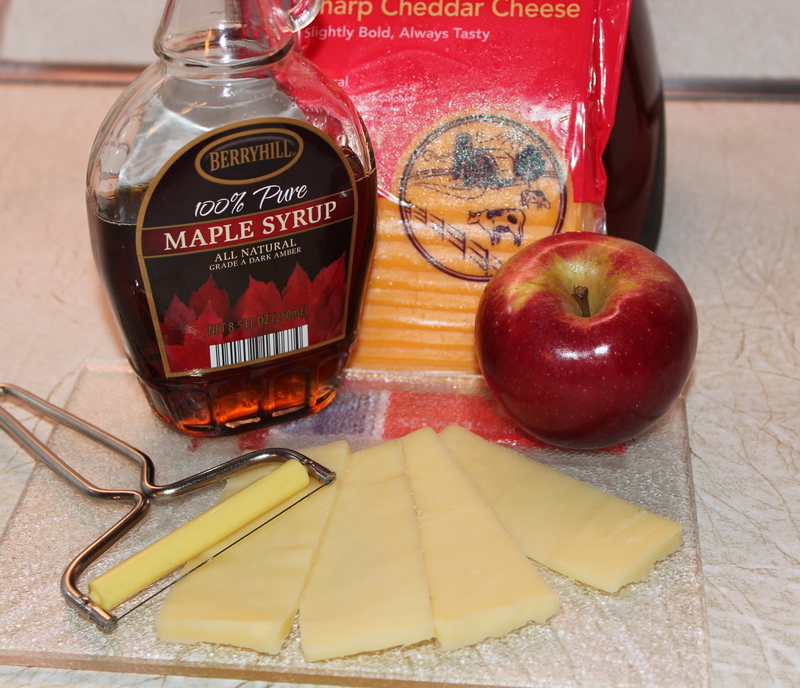 Maple Syrup, Apples and Cheese, Yum! 1. Preheat oven to 400 degrees. 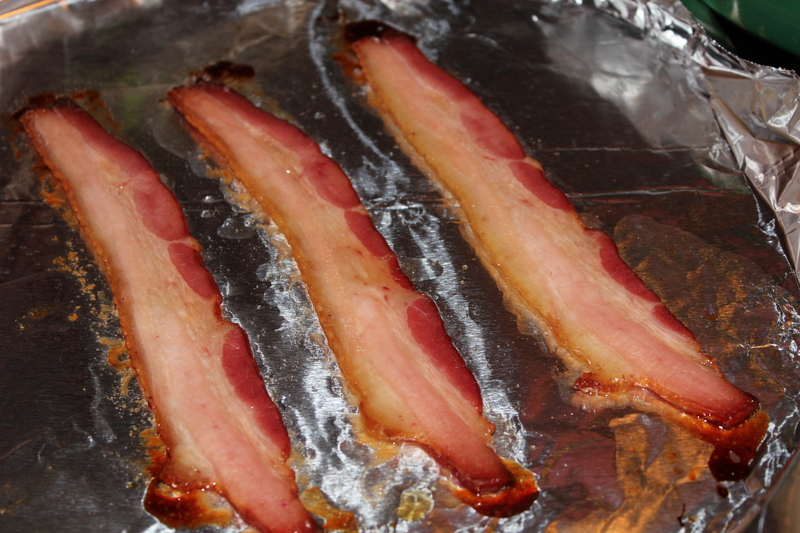 Brush each side of bacon slice with maple syrup. Place on a foil-lined baking sheet and bake at 400 degrees for about 8 minutes. Turn over, and continue baking for another 8 minutes. Since bacon slices will vary, times are approximate. Watch closely that it does not become too crisp or burned. 2. To assemble the sandwich, butter one side to each slice of bread. Lay two bread slices buttered side down, top with a slice of cheese. 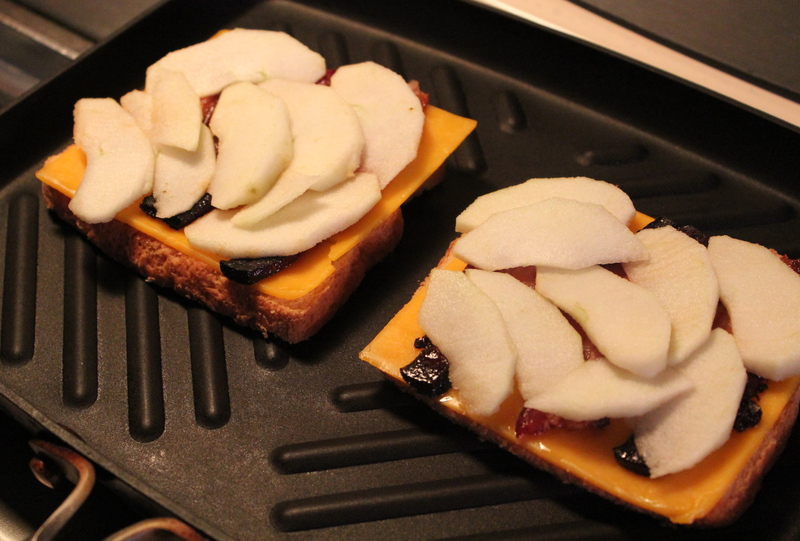 Lay 2 bacon strips on top, then some sliced apple, another slice of cheese, and then the last piece of bread, buttered side up. 3. 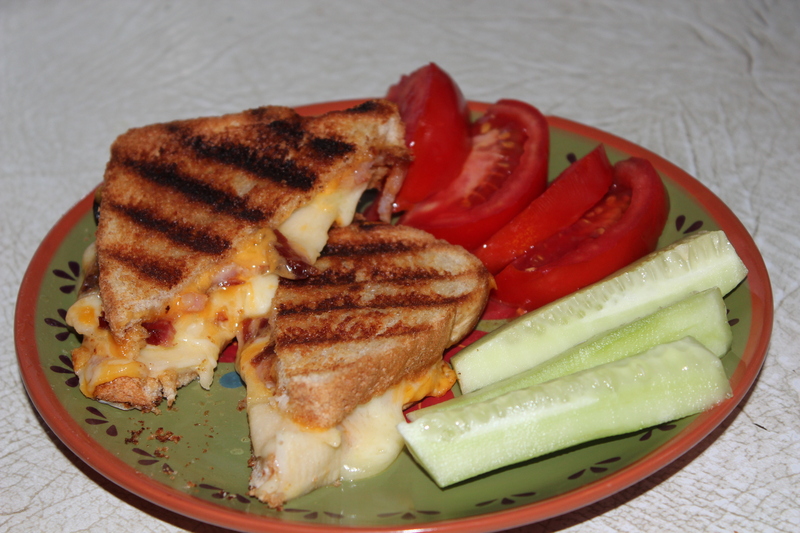 Place sandwiches, buttered side down, in a hot skillet or grill pan, and cook until cheese is melted, turning over about half way through. Sandwich should be golden and melty. It seems that when ever I make waffles there are always some left over. Does this happen to you, too? What I usually do is toast the pieces in the toaster and have them for breakfast or a snack, spread with jam or peanut butter. Well as luck would have it on the day I made the Summertime Vegetable Soup, (see July 16 post) I had a few pieces of left-over waffle in the refrigerator. 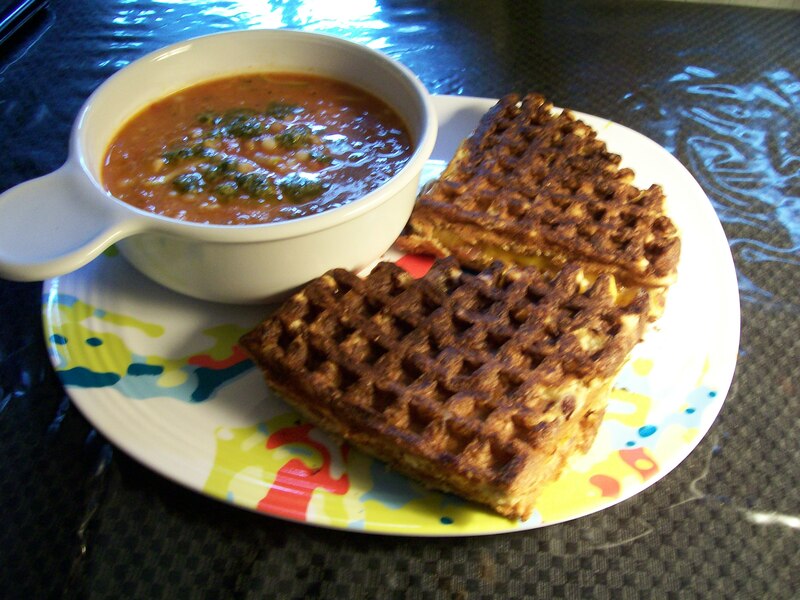 I was planning on making grilled cheese sandwiches to go with the soup, when inspiration struck: how about using the waffles instead of bread for the sandwiches. Bingo! I was all over that in a second! Out came the waffles, some sliced cheddar cheese, and some precooked bacon. On a hot grill pan I placed the bacon just to crisp it up, and it was nice enough to leave behind a tiny bit of fat to grease the pan. 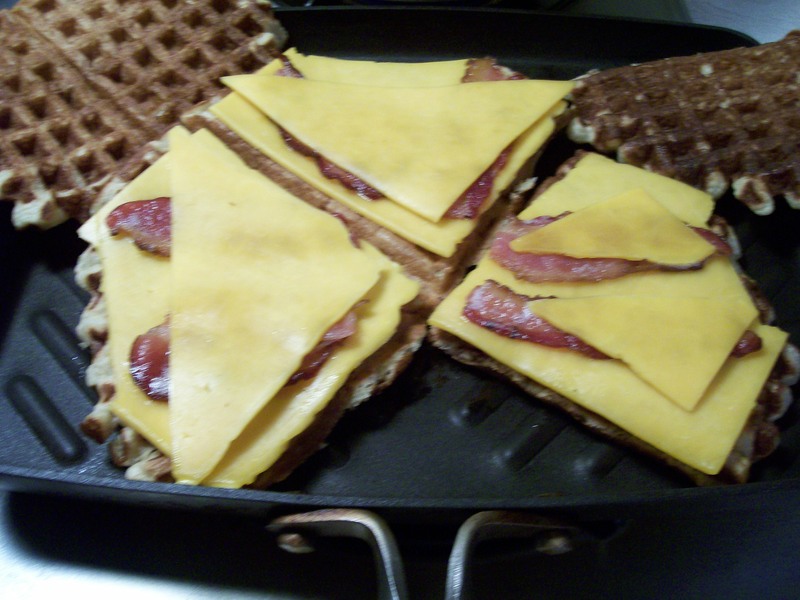 Next I lay the bottom waffle piece on the pan, covered it with slices of the cheddar cheese, lay on the bacon, more cheese to cover, then the top layer of waffle. Couldn’t be more simple. Keep the heat on low to let the sandwich toast slowly, so the cheese will melt, but not burn the waffle, since it’s already cooked. WOW! These were delicious, and a perfect accompaniment to the soup.